Fangirls. This issue was more grim than I expected, even following Pizzazz’s car crash. 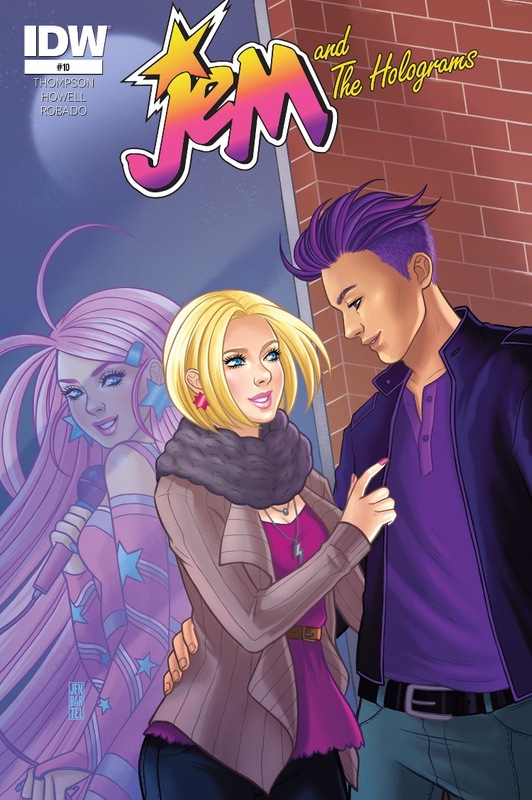 And it focuses on Rio, the reporter and (possible) love interest for Jerrica. 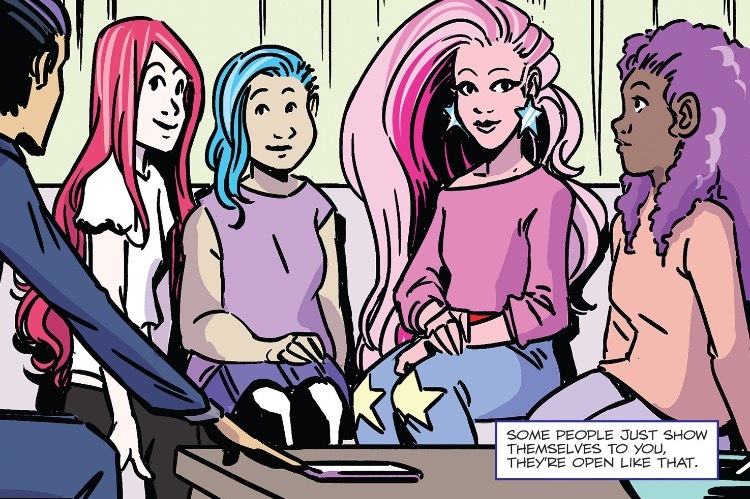 It turns out that Rio is the one who found Pizzazz at her crash site, and he’s at the hospital when Stormer gets there. 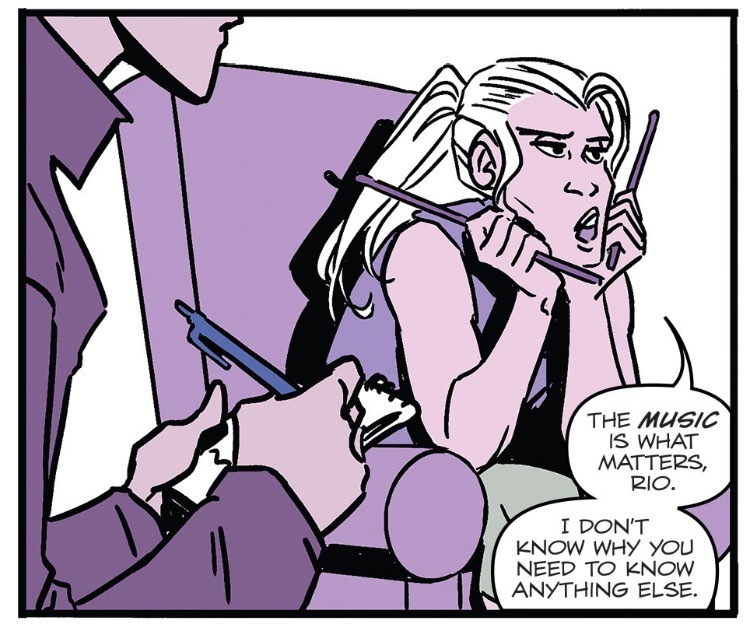 It’s a rough issue not only because Pizzazz is in the hospital, but there’s some should bearing, and Rio’s job wants him to write things he’s not comfortable writing. But we’ll get to that. 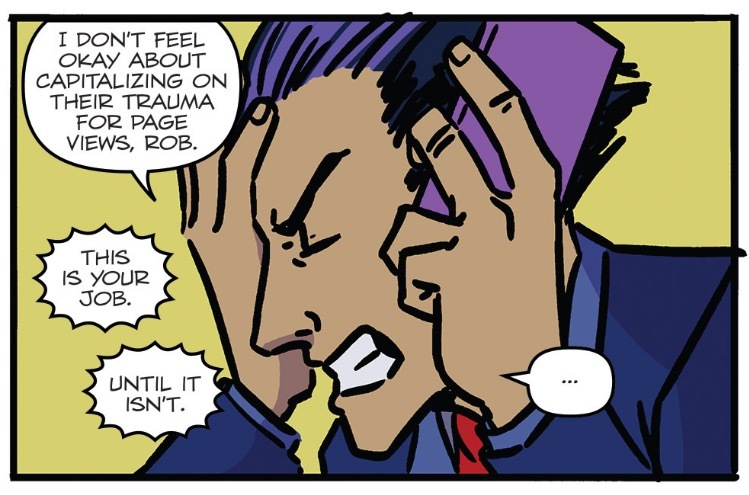 Stormer and Rio talk about what happened, and how he knows where Roxy and Jetta live because he’s tracked them down for interviews before. Stormer can’t get ahold of them, because they’re still mad about the party. But Rio goes to tell them the news, and when he says Pizzazz is in the hospital, the ladies practically bowl him over running out the door. Even though there isn’t much agreement within the Misfits, I think it’s so wonderful that they do care about each other. After letting Roxy and Jetta know what’s going on, Rio gets a call from his boss, telling him that he needs to write a piece on Pizzazz right now; one where he talks about what she’s going through and how they may have lost the headlining position on their tour, as she sustained larynx and vocal chord injuries. After his position being threatened, he tells his boss he’ll get to work; but instead of going to the hospital, he goes to the Benton house. There, he explains what’s happening to Pizzazz and the Misfits, along with what his boss is demanding of him, and asks a couple favors of the Holograms. First, that they confirm their new spot as headliner on the Misfits’ tour, and second that he interview them about it. After they call and learn that they are headlining, they have to talk to decide about the interview. And after some discussion, the Holograms sit down to talk with Rio. He thinks that he can create an article celebrating the Holograms instead of focusing on the trauma that the Misfits are going through. I think that’s rad of him. The issue, overall, was very good. The art was a bit different this time, but not in a bad way, and I really enjoyed the focus being on Rio. We’ll be back next month with issues 11 and 12!